"Good Credit, Bad Credit, No Credit We Can Do It All!!" Submit your request for financing using our online form and one of our agents will be in touch with shortly. 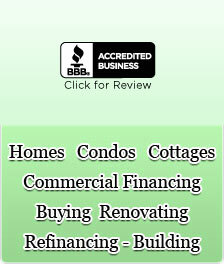 It is disappointing and discouraging when lenders fail to approve you for a home loan in Toronto. If less than perfect credit affects your ability to get a first or second mortgage, we can help you secure the funds you need to purchase the home of your dreams. Many of today's banks and financiers have long lists of qualifications that are difficult for most people to meet. Fortunately, here at Canada Wide Financial, we do things differently when it comes to home loans in Toronto. We can qualify you for a loan in several ways, including an evaluation of your employment and income, or even of the equity in your existing home. When other lenders say no, we can help you secure a private home loan. To find out if you qualify for a private home loan in Toronto, simply fill out an application. Our underwriters will review it the very same day, and you could receive approval in as little as four to 12 hours. There are no application fees, and in the event that there is an appraisal fee, we will notify you in advance. There are no long wait times, and you will never feel left in the dark. Although traditional lenders rely almost exclusively on your credit score to determine your eligibility for home loans in Toronto, we do not. In fact, we use various other criteria, including your job, your length of employment, and your income as qualifiers to help you find the funds you need. We can even help you acquire funds for a second mortgages even if you have an open bankruptcy. Whether you are interested in home loans in Toronto for bad credit, second mortgages, private mortgage refinancing, or even debt consolidation based on the equity in your home or property, we can help. We can even stop foreclosures, assist in bridge financing, and work with clients who have declared bankruptcy. Despite what other lenders say, we will work with you to discover the best solutions for your unique situation. If you need private home loans in Toronto, look no further than Canada Wide Financial. When other lenders turn you down, do not feel discouraged. Simply fill out our application, and one of our friendly, helpful representatives will contact you within 24 hours.